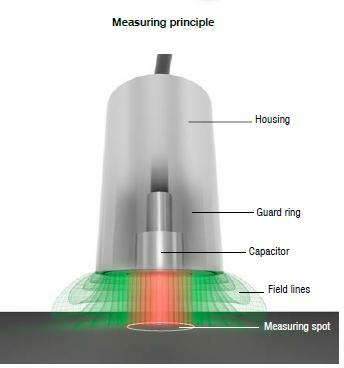 The capacitive measuring principle is one of the traditional methods used for distance, displacement and position measurement. Considered as one of the most reliable and thermally stable of the non-contact displacement measuring techniques, capacitive sensors achieve resolutions well below one nanometre. Contrary to what many engineers may think, non-contact capacitive displacement sensors are not only suitable for use in clean environments such as laboratories, clean rooms and operating theatres. The latest sensors are designed to operate in dirty, dusty industrial environments too. Modular designed sensors with threaded bodies are also available, which simplifies mounting of the sensors in industrial or process manufacturing environments. Capacitive sensors operate on a non-contact, wear-free basis. In practice, capacitive displacement sensors achieve excellent results in terms of linearity, reproducibility and resolution. While sub-micrometre precision is reached in typical industrial environments, high precision sub-nanometre measurements are possible in clean environments, where dirt, dust, oil or moisture are not present. Capacitive measurement systems are also suitable for the detection of fast moving objects and dynamic high speed processes, enabling fast, reliable measurements of motion sequences. Capacitive sensors are also suitable for use in vacuums and ultra high vacuum applications. Non-contact capacitive sensors operate by measuring changes in electrical capacitance. Capacitance describes how two conductive objects with a space between them respond to a voltage difference applied to them. When a voltage is applied to the conductors, an electrical field is generated between them, which causes positive and negative charges to collect on each object. Capacitive sensors use an alternating voltage that causes the charges to continually reverse their positions. This creates an alternating electric current that is detected by the sensor. The capacitance is directly proportional to the surface area of the objects and the dielectric constant of the material between them, and inversely proportional to the distance between them. The principle of capacitive displacement measurement is based on how an ideal plate-type capacitor operates. The distance displacement of the plates (sensor and measurement object) leads to a change in the total capacity. If an alternating current of constant frequency and constant amplitude flows through the sensor capacitor, the amplitude of the alternating voltage on the sensor is proportional to the distance to the target (ground electrode). The distance change between the measurement object and the controller is detected, processed and output as a measurement value by the controller via different outputs. However, to ensure stable measurements, a continuous dielectric constant between sensor and target is required, as the system not only depends on the distance between the electrodes but also reacts to dielectric changes in the measuring gap. In order to achieve the highest possible measurement precision (i.e. in the nanometre range), the environment should be relatively clean and dry. Maintaining a continuous dielectric constant between the sensor and target is the most important factor in ensuring stable measurements. The operating environment therefore needs to be relatively clean and dry. Oil or moisture in the air gap, for example, can affect measurement performance by causing sensor drift and changes in the output signal. However, some dust or dirt in the air gap is acceptable, as the sensors typically operate at such high resolutions that the effects of some dust particles is quite low. As an electromagnetic process, a capacitive measuring system measures on electrically conductive objects with constant sensitivity and linearity as standard. The system evaluates the reactance of the plate capacitor, which changes in proportion to the distance. As there is no interference caused by the optical characteristics of the target, even transparent or reflective surfaces can be measured at high precision. Examples of conductive measurement objects are metals, silicon, graphite and water. Capacitive sensors can also measure insulating materials such as plastics, ceramics, glass, oils and adhesives. Here, the sensor grounding acts as ground electrode and the insulating material as a coupling medium. An almost linear output signal for insulators is also achieved by using special electronic circuitry. Capacitive displacement sensors are typically used on metals, but advice and guidance should be sought from the sensor supplier when measuring on insulators. In most capacitive sensing applications, the sensor is one of the conductive objects and the target object is the other. For accurate measurements, the electric field from the sensing area needs to be contained within the space between the sensor and the target. If the field is allowed to spread to other items or areas on the target, a change in the position of the other item will be measured as a change in the position of the target. Guarding is therefore used to prevent this from happening. Most sensor suppliers use a guard ring principle, although some suppliers such as Micro-Epsilon offer a guard ring principle combined with a special triaxial cable (double guarding). Extremely small measuring distances cause an equally small change in the signal. This means there are only a few electrons between sensor and controller for an indicated change in distance. If only very small leakage (parasitic) currents also now flow on the path from sensor to the controller, the distance measurement is no longer accurate. Therefore, very complex triaxial cables are required. The RF cables used by Micro-Epsilon provide excellent shielding characteristics, actively guarding the field in order to ensure consistently high signal quality with low noise. Micro-Epsilon has also developed other, unique cables that allow cable lengths of up to eight metres without having to use an additional preamplifier, which at the same time enables full exchangeability between sensor, controller and cable. While the previous outgas-optimised and oxygen-free (CCx) triaxial cables are suitable for different applications from very low temperatures through to laboratories and semiconductor production, these new (CCg) cables are specifically designed for industrial environments, where long cable lengths are advantageous. As thermally induced conductivity changes of the measuring object have no influence on measurements, the capacitive principle is reliable even with fluctuations in temperature. As well as temperature stability, the long term stability guarantees reliable operation over many years without parts or components needing to be replaced. In an experimental environment where the measuring range will typically vary from test to test, the user requires a capacitive measurement system that allows this. A system that needs re-calibrating each time a different measuring range is required would be costly and time consuming. It is therefore important to select a sensor supplier that can offer a system whereby various capacitive sensors can be exchanged without having to send the sensor back to the supplier’s factory for recalibration each time. Electrical runout occurs in rotating ferrous targets. It shows up as a very repeatable error once per revolution on the system output and is caused by small variations in the permeability and conductivity along the circumference of, for example, a rotating shaft. Whilst eddy current displacement sensors are affected by electrical runout, capacitive sensors are completely unaffected by this problem. As they are based on an analogue circuit, capacitive sensors measure using a measurement frequency or bandwidth rather than a measuring rate. This means they are suitable for measuring vibration, amplitude, oscillation and shaft runout. Some suppliers offer capacitive sensors that measure up to 20kHz (-3dB) bandwidths, making them ideal for high speed measurements on rotating shafts. The target size is a key consideration when selecting a sensor for a specific application. The further the sensor is from the target, the larger the minimum target size. If the target area is too small, the electric field will tend to wrap around the sides of the target, which results in the electric field extending further than it was during factory calibration and will measure the target as further away. 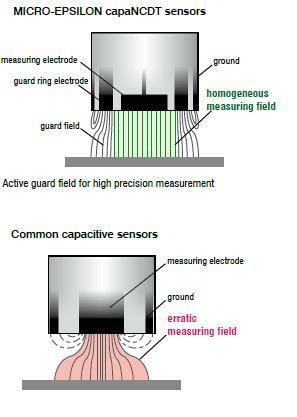 In general, capacitive sensors require a target size ratio of 1:1 with the size of the measurement electrode. Smaller or narrower targets can be measured but require some special adaptation from the supplier. The shape of the target is also important. As most sensors are calibrated to a flat target, measuring a target with a curved surface will cause errors. As the sensor will measure the average distance to the target, the gap at zero volts will be different to when the sensor was calibrated. The electric field behaves differently on a curved surface compared to a flat surface. If a curved or non-flat surface must be measured, the measurement system can be factory calibrated to the final target shape. However, it is recommended that advice is sought from the sensor supplier as some customisation will be required.